Rosemary, a classic herb for cooking and of old formal herb gardens makes its appearance in our soap products. 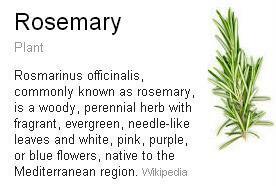 We grow several rosemary plants in our herb garden, for cooking and for use in our soaps because we love the woody fragrance and the appearance almost of pine needles. Nothing better than a sprig or two with chicken, or in a pot of soup. Rosemary has a very old reputation for improving memory and has been used as a symbol for remembrance during weddings, war commemorations and funerals in Europe and Australia. Mourners would throw it into graves as a symbol of remembrance for the dead. In Shakespeare’sHamlet, Ophelia says, “There’s rosemary, that’s for remembrance.” (Hamlet, iv. 5.) A modern study lends some credence to this reputation. When the smell of rosemary was pumped into cubicles where people were working, they showed improved memory, though with slower recall. We just love the clean scent of rosemary… and our soap offers rich lather, and gentle cleaning. I don’t know if it will improve memory… but i know you will love how your bathroom fills with the rich fragrance. Our Soap combines Rosemary with Clary Sage, another woodsy, deeply herbacious scented herb. A Blend of olive oil, palm and coconut oil, lye and the essential oil of clary sage, we add chopped Rosemary fresh to the mixture. The two herbs combine to bring a deep and wonderful clean fragrance. As i have mentioned previously, we are honored to be able to post the Handcrafted Soapmakers Guild Seal on all of our products, as we are members of this professional organization. Our soap is gently wrapped in a light wax paper, then banded with a label that clearly details our ingredients and contact information.